It’s time to celebrate! I am doing very well with Teachers Pay Teachers and with my blog, so why not celebrate with a contest to win FREE stuff? (Plus, today is my birthday, so I’m feeling especially happy! Cue the music… I’m Happy!) I’m giving away my new science product, Buzzzzzzzing with Science. (See the Rafflecopter well down the page). 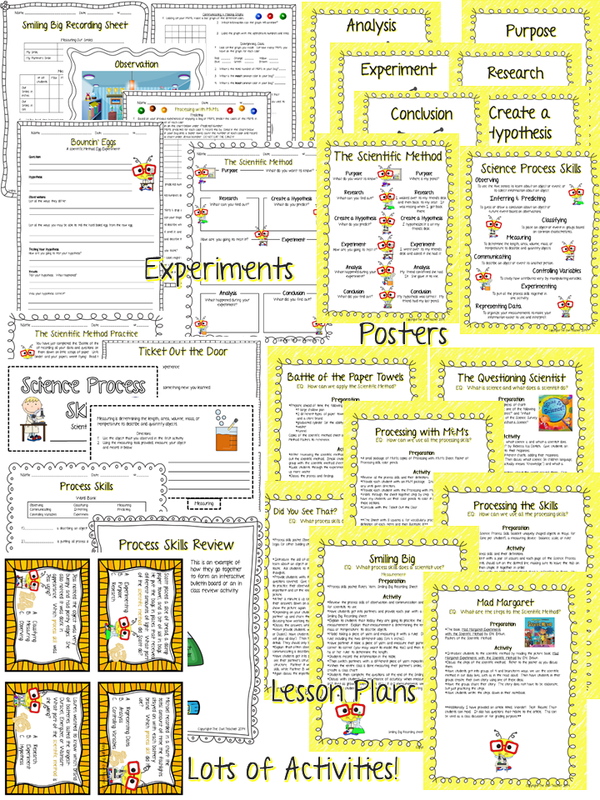 This 58 page science packet has lots of great sources to help you get a great start in science this year. 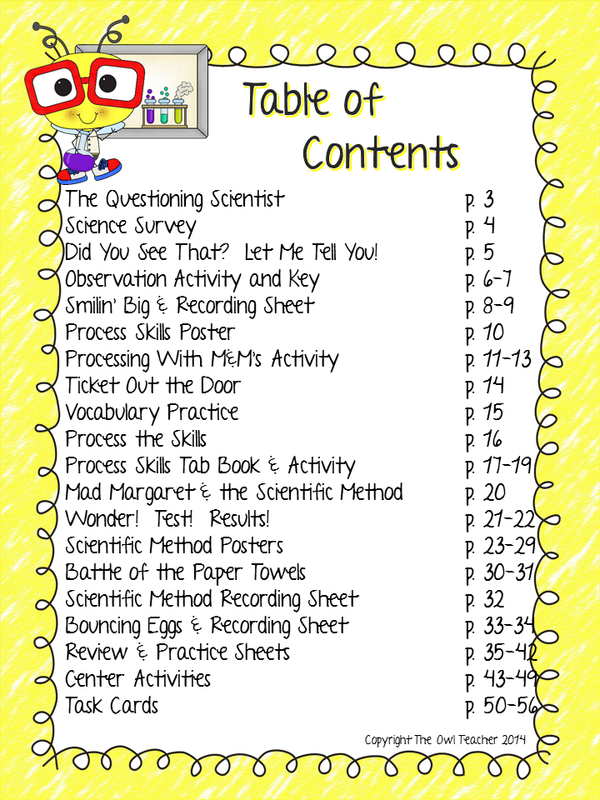 It has lots of lesson plans, activities, labs, and experiments to learn the scientific method and the science process skills. Just click on the picture to download it or click here to download it for FREE! Thanks for the sweet freebie! Absolutely! I hope you can use it! Hi! It's not there anymore because that givewaway was over a year ago. I'm sorry! As the past President of the National Science Teachers Association and author of the book series, Uncovering Student Ideas in Science, I have to tell you that this chart perpetuates a major misconception about hypotheses. Scientific hypotheses ARE NOT predictions. They are tentative explanations based on prior observations or background research. If students do not have the background knowledge or prior observations to make a hypothesis, then they make a prediction. But the two are NOT the same! Students either make a prediction or make a hypothesis. Also, science education is moving away from "The Scientific Method" which falsely implies there is just one way, consisting of a rigid set of steps, that scientists use to investigate. Science is methodical but there are many different ways scientists investigate. Currently, science is moving toward helping students understand "the practices of science" rather than the Scientific Method. Just trying to be helpful and support accurate conceptions of the nature of science so that students don't develop misconceptions about how science is practiced in the real world. Thank you for your comment. I am indeed aware that they are moving away from the scientific method, but as with all things in education it is a slow change. At this time nearly all schools, especially at the elementary level are just implementing and getting students familiar with science through this practice. This makes it easier for the upper grades and schools to move forward. I also do understand that a hypothesis is not a prediction but rather an "educated guess" based on background knowledge. While the use of the term "prediction" could be frightening to true scientists in the world, teachers do teach students that a prediction is not just a straight guess. We educate students to make a prediction based on evidence and to support their reasoning. We never teach kids to just make a guess without using observations and background knowledge. Perhaps I should have used the term inference. Thanks again for your information and for helping out. I do apologize for any misconceptions that you feel I may have put forward as that was never my intention. In fact, my intention with all of my science blog posts is to get kids excited about science, especially girls, as that is strongly needed. thanks for this! just what i needed today! !